We recommend checking out our discussion threads on the IndiPRO Tools LEDVX1 Bi-Color On-Camera LED Light Kit LEDVX1, which address similar problems with connecting and setting up On Camera Lights IndiPRO Tools. 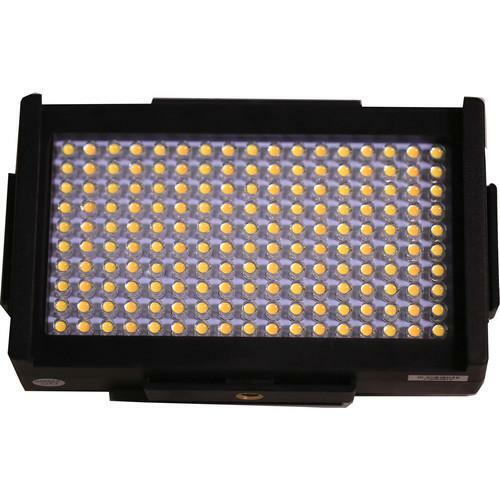 The user manual for the IndiPRO Tools LEDVX1 Bi-Color On-Camera LED Light Kit LEDVX1 provides necessary instructions for the proper use of the product Professional Video - Lighting - On Camera Lights. The LEDVX1 LED Light from IndiPRO Tools is a lightweight on-camera light offering continuously adjustable color temperature from 3200K tungsten to 5600K daylight via a dial on the rear. It also features a digital display on the rear that provides color temperature, brightness, and battery info. Aside from specifying your settings, this display enables you to efficiently match the output of additional units or to note down your settings for potential repeat setups. This light also offers interlocking rails all around that allow multiple units to be stacked on top of and side-by-side one another. The light comes with an L-Series battery, battery charger, car lighter charging adapter, AC power-supply, removable four leaf barn-door assembly, softbox cover, diffusion filter, and shoe mount adapter. An L-series battery plate is integrated on the rear. The barn doors allow you to manipulate the beam angle for varying applications. The diffusion filter can be used with the barn doors attached or removed. Brightness is adjustable between 100% and 10%. A 1/4"-20 mounting thread is available on the bottom supporting the included shoe mount adapter or optional articulating arms or other accessories. If you own a IndiPRO Tools on camera lights and have a user manual in electronic form, you can upload it to this website using the link on the right side of the screen. Box Dimensions (LxWxH) 10.6 x 6.4 x 4.3"
The user manual for the IndiPRO Tools LEDVX1 Bi-Color On-Camera LED Light Kit LEDVX1 can be downloaded in .pdf format if it did not come with your new on camera lights, although the seller is required to supply one. It is also quite common that customers throw out the user manual with the box, or put the CD away somewhere and then can’t find it. That’s why we and other IndiPRO Tools users keep a unique electronic library for IndiPRO Tools on camera lightss, where you can use our link to download the user manual for the IndiPRO Tools LEDVX1 Bi-Color On-Camera LED Light Kit LEDVX1. The user manual lists all of the functions of the IndiPRO Tools LEDVX1 Bi-Color On-Camera LED Light Kit LEDVX1, all the basic and advanced features and tells you how to use the on camera lights. The manual also provides troubleshooting for common problems. Even greater detail is provided by the service manual, which is not typically shipped with the product, but which can often be downloaded from IndiPRO Tools service. If you want to help expand our database, you can upload a link to this website to download a user manual or service manual, ideally in .pdf format. These pages are created by you – users of the IndiPRO Tools LEDVX1 Bi-Color On-Camera LED Light Kit LEDVX1. User manuals are also available on the IndiPRO Tools website under Professional Video - Lighting - On Camera Lights.